Explore the extraordinary oceanfront properties of the Forest Beach area, one of the oldest residential areas on Hilton Head Island. Discover the countless reasons that have drawn repeat guests and newcomers to Forest Beach area year after year for generations! The feel of sandy shores, the sound of the ocean, and the peacefulness of oceanfront living could be the backdrop to your luxury dream home here. Enjoy the breathtaking views of the Atlantic Ocean, with plenty of beach access for riding bikes, walking, or just enjoying the sand and surf. Explore the infinite opportunities for recreation and relaxation at Forest Beach for a vacation distinct from any other. The three-mile Forest Beach area, comprised of the North and South residential areas meeting at Coligny Circle, is known for its close proximity of beach access. Each lot is within 600 yards of the Atlantic Ocean. Luxury oceanfront homes in Forest Beach can be the older smaller homes built in the 60’s and 70’s to the new modern seven and eight bedroom vacation homes, all with spectacular ocean vistas. While most of Hilton Head Island’s plantation communities are gated, Forest Beach is located outside of the gated communities, which makes for some of the best prices on the Island for oceanfront homes. Homes and condominiums in Forest Beach can be rented on the short term rental market, making this area an ideal investment. Not only does Forest Beach have an easy-to-find location but many of the island’s amenities are within a stone’s throw. Dozens of shops, boutiques, restaurants, putt-putt golf courses, and night spots for entertainment, are within walking or biking distance.Many of the luxury rentals have private pools on property. There is a resort feel to the entire island, with no billboards, and strict guidelines for street signs, and building colors. And buildings cannot be built higher than the trees. There are a limited number of oceanfront homes and condominiums. The area is accessible by the Hilton Head Island Airport, and the Savannah International Airport is less than an hour’s drive. In the North Forest Beach area, each street is named for an avian species. Dove Street, one of these small sandy lanes, has been known for its decorations during the Christmas season; and Jacana Street is a gathering place for the island’s dedicated surfers because the wave patterns there are the best the island has to offer at high tide. Although the Forest Beach area has no golf courses of its own, Hilton Head Island’s many golf amenities are just a short drive away. Near the Forest Beach area are two popular, well-merited tennis facilities: the Van der Meer Tennis Center and the Shipyard Racquet Club which also features Dennis Van der Meer tennis. The nearby Players Club Resort features more tennis courts and workout facilities.With the close proximity of the beach, numerous water sports are also available. Surfing, sailing, paddle boats, and beach volleyball are a few of the many options owners and guests to the area have access to. Live in Paradise! 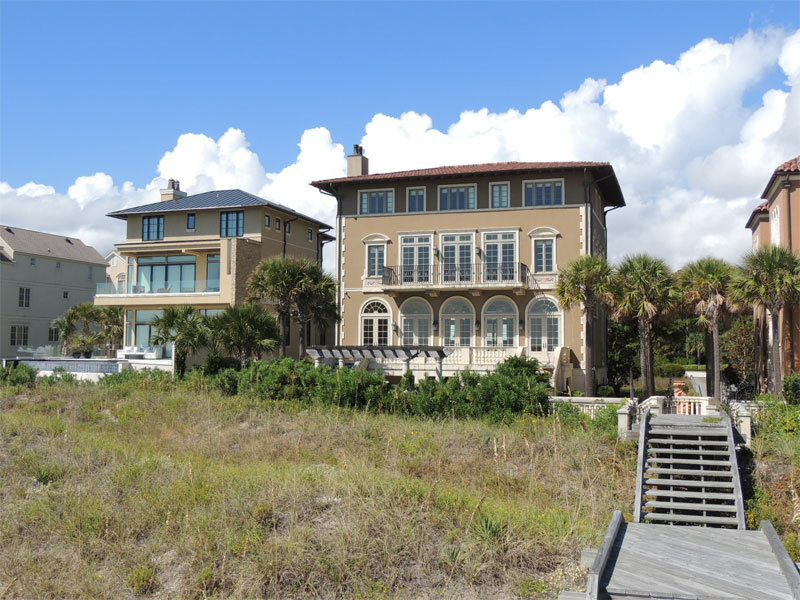 Our company, Hilton Head Luxury Homes, Inc., specializes in luxury real estate on Hilton Head Island – oceanfront property, golf view property homes, lots, and rental property. Visit our website at www.HiltonHeadLuxuryHomes.com or email us at HHLuxuryHomes@gmail.com, or call 800-414-7253 or 843-384-7253. We look forward to helping you find your dream home! Want to visit Hilton Head? You can book a luxury vacation home on the Island, please go to www.HiltonHeadLuxuryVacations.com to make a reservation today. In the North Forest Beach area, each street is named for an avian species. Dove Street, one of these small sandy lanes, has been known for its decorations during the Christmas season; and Jacana Street is a gathering place for the island's dedicated surfers because the wave patterns there are the best the island has to offer at high tide. Although the Forest Beach area has no golf courses of its own, Hilton Head Island's many golf amenities are just a short drive away. Near the Forest Beach area are two popular, well-merited tennis facilities: the Van der Meer Tennis Center and the Shipyard Racquet Club which also features Dennis Van der Meer tennis. The nearby Players Club Resort features more tennis courts and workout facilities.With the close proximity of the beach, numerous water sports are also available. Surfing, sailing, paddle boats, and beach volleyball are a few of the many options owners and guests to the area have access to. Live in Paradise! Our company, Hilton Head Luxury Homes, Inc., specializes in luxury real estate on Hilton Head Island - oceanfront property, golf view property homes, lots, and rental property. Visit our website at www.HiltonHeadLuxuryHomes.com or email us at HHLuxuryHomes@gmail.com, or call 800-414-7253 or 843-384-7253. We look forward to helping you find your dream home! Want to visit Hilton Head? You can book a luxury vacation home on the Island, please go to www.HiltonHeadLuxuryVacations.com to make a reservation today.